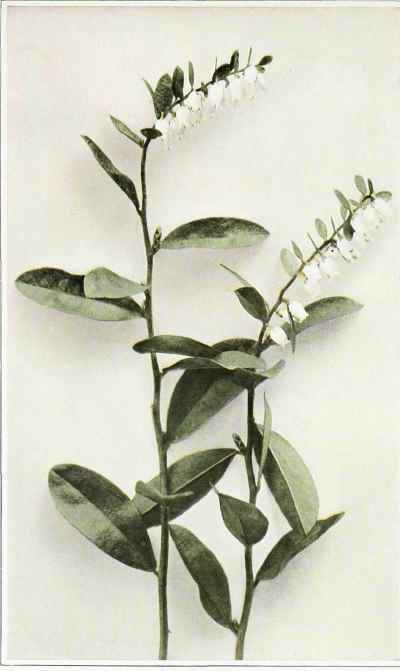 A small, erect shrub with numerous branches, 1 to 4 feet high. Leaves alternate, leathery but rather thin, evergreen, very short petioled, blunt or pointed, oblanceolate or oblong in shape, covered on both sides and more densely so beneath with small, round, scurfy scales, especially when young, one-half to 11/2 inches long, the margins slightly toothed, the upper leaves reduced to bracts which subtend the flowers. Old leaves often bronzed or brownish in contrast to the bright green of the new leaves. Flowers white, fragrant, solitary in the axils of the upper small leaves, forming a terminal, leafy, one-sided raceme; corolla oblong-cylindric, about one-fourth of an inch long, narrowed at the throat, the margin with five recurved teeth. Stamens ten, not projecting from the flower. Fruit a globular capsule, about one-eighth of an inch in diameter. In swamps, bogs and wet places, Newfoundland to Alaska, south to Georgia, Illinois, Michigan and British Columbia. Flowering in May and June.